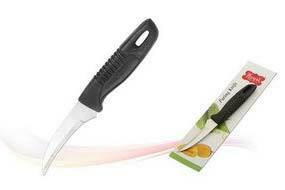 We are an acclaimed manufacturer, Supplier, and Exporter of Paring Knife. We carry out our operations from Rajkot, Gujarat, India. We are backed by a team of diligent professionals, which crafts it with a high level of precision. We offer it to various restaurants and hotels, at a cost-effective price. We lavishly pack our Paring Knives, to avoid kind of damages to the product during transit. Our professionals thoroughly examine the entire range on the basis of various quality parameters.